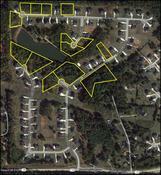 On-Site: Subject property consists of 14 single family lots. All of the subject sites are fairly rectangular and with street frontage ranging from 65 to 163 feet. Nine of the subject lots are considered as Cul-De-Sac lots. Lot Sizes: Lots vary in size from approx. .61 to 1.36 acres.